Bishop's staff in silver filigree with 6 red corundum stonesand 6 Swarovski crystals, in set with pectoral cross NK017 and panagia PN010. Material: silver 950, red corundum, Swarovski crystals, wood. Technique: filigree, granulation, incrustation, wood (Goran Josijevic, Krusevac). 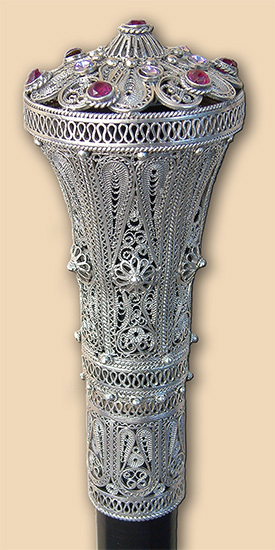 Size: staff 130 cm, filigree dome 65 (30) mm, height 15 cm. Weight: dome and rings 168 gr. Commissioned by: Father Milomir Vlaskovic, Priluzje - Kosovo and Metohia..